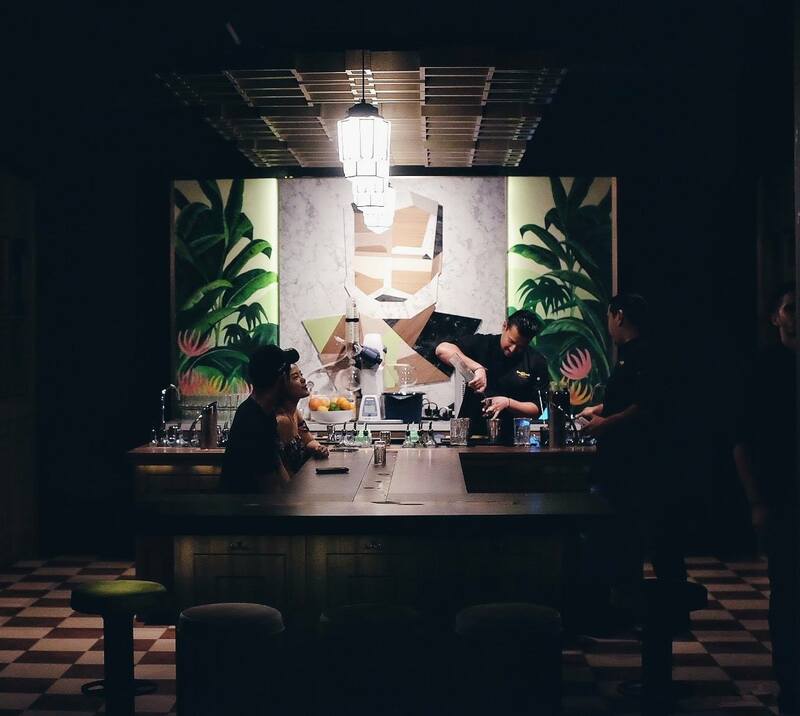 Hidden behind a discrete door in KeSA House is The Old Man Singapore, a sister venue to the award-winning, Hemingway inspired cocktail bar from Hong Kong that earned spots on Asia’s 50 Best Bars and the World’s 50 Best Bars just a year after opening. To be honest, we aren’t all that surprised that they chose Singapore as the locale for their first overseas venue because the tippling scene here seems to be getting more sophisticated every day. Now with this addition to the Keong Saik hood, cocktail connoisseurs have another slick spot to sample imaginative libations. We popped in one night after dinner, and had to actively seek out the entrance because it’s one of those places that you could easily walk right past and not even know it’s there. That’s part of the charm though, especially when you step into the cosy space done up in tropical motifs like plant-patterned bar stools. The bar is shaped like a capital I, so you can watch the bartenders in action and converse with friends and neighbours. There are also tables in the back for a more intimate drinking experience. The service was great, as the bartenders were happy to introduce us to the menu and concept and answer any questions we had. The menu is super creative with a few cocktails from the flagship plus some new creations. Try ‘The Snows of Kilimanjaro’ featuring marshmallow gin, lacto-fermented raspberry, citrus, and gruyère cheese on top, or pay homage to Hemingway with ‘The Sun Also Rises’ featuring copra fat-washed applejack, curry leaf infused gin, sweet vermouth, sous-vide pandan leaves, and kaffir lime. Like it’s Hong Kong sister, The Old Man Singapore celebrates the spirit of Ernest Hemingway and his love for libations. Inside you’ll find a contemporary mural of Hemingway overlooking the bar and cool touches like tropical greenery, gorgeous wooden shelving and black and white tiled floors. The bar is helmed by Andrew Yap (previously of Neon Pigeon), who draws on the playful creativity of the cocktail menu from the original venue but adds his own unique twists. Ever since Cufflink Club and The Library closed, we feel that Keong Saik has been needing a new cocktail bar, so we’re stoked to have a cool place like this to hang out for a few drinks pre or post dinner. When you’re trying to track down the entrance, keep an eye out for the hanging pineapple over the door. This is a great bar to sit, chill and enjoy a few cocktails with a small group of friends. The Old Man Singapore, 55 Keong Saik Road #01-04, Singapore 089158. p. +65 6909 5505. Open Mon – Sat 5pm – 12am.